For more than 40 years, Lakeland Christian School has offered our students private piano lessons. What began with one teacher and 40 students has expanded to more than 250 students enrolled in the program. Kindergarten and first grade students may participate in the piano lab program. In a group setting, the students learn the basics about playing the piano and reading music. The course is designed to help parents determine whether their child shows an interest in learning to play the piano before purchasing the instrument. Students in second through twelfth grade may enroll in private piano lessons. Participation in this program is contingent upon having a piano in the home. 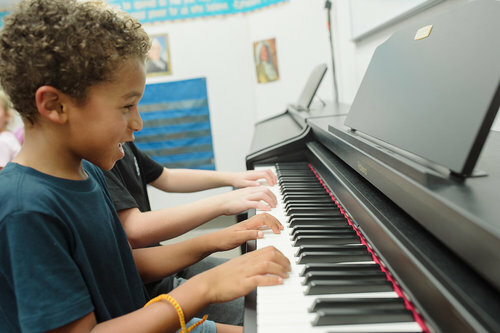 In addition to learning to play the piano, students receive instruction in ear-training and written music theory. Piano students are encouraged to use their musical gifts by playing for chapel programs and in their churches and at other community events. They also have opportunities to participate in the Multiple Piano Festival, Florida Federated Music Clubs Junior Festival and Florida State Music Teachers Student Day. All piano lab and private lesson students perform in a spring recital. In the fall of 2918, a six-week preparatory class will be offered for parents of beginning piano students. Classes will run from August 15th – September 19th. There will be two sessions offered: 8:00 – 8:30am or 11:15 – 11:45am. Each session is limited to six parents. We have found that unless a parent knows enough about piano to assist during the child’s at-home practice times, both the child and the parent have questions about how to approach the lesson assignment. During the six “parent” lessons, you will learn basic piano skills needed to assist your child through the first year of lessons. Read across the music as it changes from the left to the right hand or vice-versa. Cost for the 6 weeks of lessons will be $75.00. If you have any questions, please call Lorraine Latham, Piano Department Chair, at school during the day (863-688-2771), email her at llatham@lcsonline.org or text her at 863-640-9225. ***This class would also be very beneficial to parents who have had students go through their first year of piano and are still struggling with reading the music, keeping a steady beat and approaching a new assignment.